and a rotating roster of films and videos, engineering designs and drawing, works in clay, sacred-music performances, Ciceronian oratory, MP3 recordings, and more. Louis G. Elson ’85, co-founder and managing partner of Palamon Capital Partners, a London-based private-equity firm, whose philanthropic support has underwritten the Elson Family Arts Initiative—five years of funding that enables Sorensen to solicit grant proposals to seed arts-making ventures throughout a wide variety of courses. To allow innovation and imagination to thrive on our campus, to educate and empower creative minds across all disciplines, to help shape the twenty-first century, Harvard must make the arts an integral part of the cognitive life of the university: for along with the sciences and the humanities, the arts—as they are both experienced and practiced—are irreplaceable instruments of knowledge...Art-making is an expressive practice: it nurtures intense alertness to the intellectual and emotional resources of the human means of communication, in all their complexity. It requires both acute observation and critical self-reflection. Through data visualization and translation. With new ways of conceptualizing questions and information, from the beginning of the process. By providing different strategies and expertise for working through problems. By spurring technological innovation through the demands of their own creative vision. By improving future research capacity through improved retention of at-risk students, and students from diverse backgrounds. In his own General Education course on the history of photography, for instance, students have an option to do a photography project in place of a research paper, Kelsey said; the Elson funds have allowed him to bring in two local practitioners to work with the students, who have, in turn, produced stunning portfolios like a bound book of winter images in New Hampshire’s harsh White Mountains. The work, he hastens to emphasize, is not student amateurism; it is about “finding ways to make art-making an intellectual inquiry.” The students who pursue a photography project must also write about the process and put it into historical perspective. The results, he said, enable him to see clearly what students have come to understand about the history of the medium from engaging with the course content. That approach accords closely with his family’s aim in underwriting art-making at Harvard by providing a sort of “venture funding,” Louis Elson said in a telephone conversation from London. 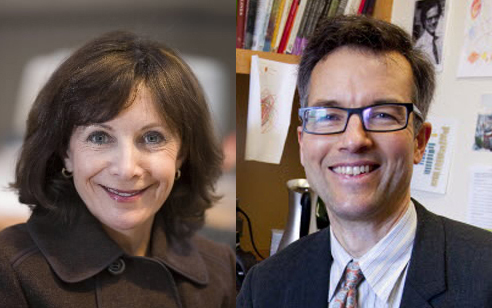 When they sought to become engaged with art-making at Harvard, Louis said, the Elsons were initially interested in the study centers being created in the renovated Fogg Art Museum. But when they were introduced to nascent efforts to promote “active engagement” of students with art-making, Sorensen’s curricular goals immediately resonated. 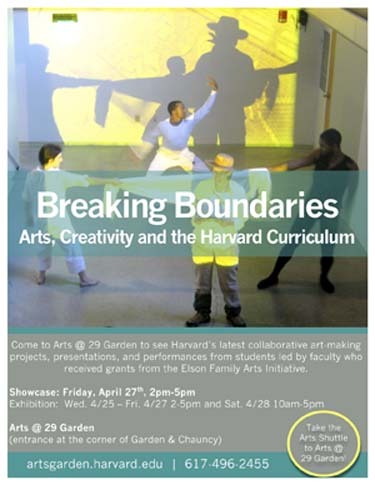 By doubling her request, he said, the Elsons could seed a broad array of arts innovations; provide some tangible, external validation for the initiative; and support ways of displaying the results to the community and conferring recognition on the students and faculty members involved—at the April 27 Arts First exhibition, for instance. Underwriting the instructional grants for five years, he said, should yield a sufficiently broad array of experiences, over a sufficiently long time, to help inform the University’s decisions on implementing the 2008 task-force recommendations as it builds specific arts-related elements into the plan for the capital campaign. During those five years (this is the third), he said, professors and administrators have “had enough runway to make something happen and see it go” and are now in a position to “improve the reach and efficiency” of curricular art-making in ways that will really affect students’ Harvard experience. “Part of the genius of the program,” he said, “is that it is not course-specific,” in that the funding applies in any course, regardless of subject or title, where a professor conceives a way of using art-making to broaden and deepen students’ access to and involvement with a subject. In Dean Sorensen’s view, when she, fellow professors, students, the Elsons, and others convene April 27 at “Breaking Boundaries” on Garden Street, they will all see “the transformative effect that art-making has had on the curriculum and students’ work”—the venture-funded sprouts of what they hope will become a much greater University investment in art-making, performance, and creative work in the Harvard of the future.